Sometimes I find myself wondering whether to continue writing these types of posts, they are now somewhat pretty old when it comes to beauty blogging; one may even argue that they’re ‘old school’ and perhaps no longer have a place within beauty blogging of today. That being said, the nosy beauty parker in me can’t help but want to read these types of posts when I spot them on my Bloglovin feed, they for me seem to be some of the most insightful if you really want to know what somebody truly thought of a product. Having such a busy day to day life I must admit to finding myself relying a bit more on dry shampoo than I would normally care to admit. Therefore, when a new brand makes its way onto the shelves of the high street I normally have to try it out pretty soon. To be honest I was not overly impressed with the Colab Dry Shampoo, it just didn’t work for me very well at all. My go to has been Batiste for a good few years now and it continues to beat every dry shampoo I try against it. Whilst the Colab dry Shampoo worked initially I found that after a couple of hours my hair was looking rather limp again which of course led me to feeling a little bit self-conscious. This just sadly wasn’t for me, therefore I will be sticking to my fail safe from now on. This has been lying around for a little while so it was about time that I focused upon finishing it off so that I could make way for a new cleanser within my routine. Generally speaking, I rather enjoyed using this product as I felt as though it left my skin feeling clean and looking brighter without any loss of moisture. This was a really nice morning cleanse and I would happily use it again in the future. I also note that it lasted a really long time too making it rather good value for money. One may remember back in March that I featured this foundation within my March Beauty Favourites; yes, it warranted such a claim. To date this has been one of the nicest foundations I have ever used. Whilst it doesn’t necessarily have the lightest texture upon application, it does when buffed in create a beautiful finish on the skin. The only downside is that it is pricey, I’m talking £45 pricey. 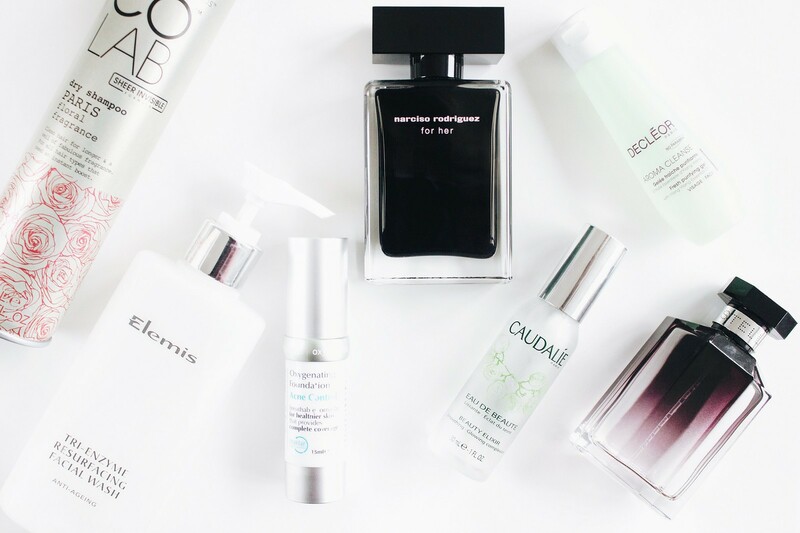 This year has been the first year in which I haven’t purchased a fragrance, it is rather unusual for me as I tend to adore perfumes, however I have cut back a lot recently on beauty purchases. This of course has had an impact on my fragrance collection as I have used not one, not two but four fragrances up this year. Narciso Rodriguez For Her has to be one of my favourites of late, it is an utterly gorgeous scent which is ideal for this time of year. For a full review of this head onto my Narciso Rodriguez post from March last year. One of the most disappointing products I have ever used within the time in which I have being writing about beauty sadly comes in the form of the Caudalie Beauty Elixir. For me I think the downfall of this product is the sheer hype that surrounded it, it was pretty big which of course led one to believe that this was a miracle in a bottle. In my experience nothing could be further from the truth as it did nothing for me whatsoever, other than leave an £11 dent within my purse. On a more positive note I know many bloggers who absolutely adore this product, therefore for me I have arrived at the conclusion that it is somewhat of a marmite product, you either love it or you hate it. This was a nice little cleanser to use and it is one that I would gladly use again because it did the job well. It wasn’t harsh on my skin or overly scented, it was a nice simple product which worked. To be honest I find it hard to write much about this as I didn’t use it for very long due to it being a small travel size bottle, that being said I did review a travel set from Decléor which featured a number of products from their purifying skincare range, in which I have to say I really did like their matifying lotion. Stella by Stella McCartney has for a good five years now been one of my all-time favourite scents, in fact it is probably right up there with Armani Black Code which I utterly adore. I am incredibly sad to say goodbye to this as I won’t be repurchasing it for a little while, especially as we head towards Christmas. As I delved through the archives I found a very old review of Stella by Stella McCartney from way back in 2013. One will have to ignore the incredibly poor photograph as it was way back when I had no concept of how to take a somewhat passable blog image, however the review is still relevant.